Don recently purchased his Chevelle from its second owner, a retired fire fighter, in Wappinger’s Falls, NY. This numbers matching Super Sport has a mere 78,000 miles on the odometer. Don says that his Chevelle is just as clean on the upside as it is on the underbelly. 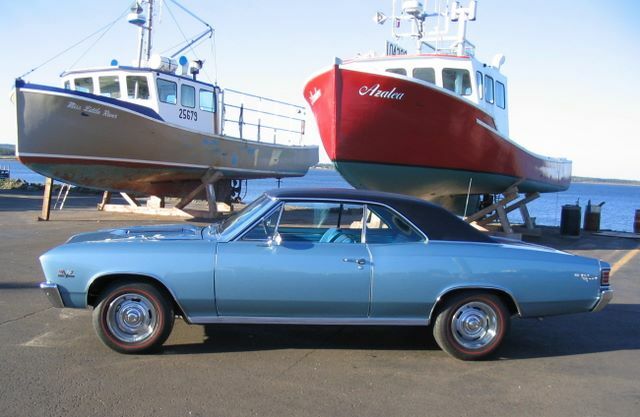 Aside from its numbers matching 325 horsepower big block and 4 speed transmission, this Super Sport retains many of the original parts including the weather stripping (until Don replaced it upon purchase). He has also carefully replaced many of the detail items including the speedometer, body bushings, arm rests, clock, radio dash bezel, shocks, and a Retro Radio system. All in all, his Chevelle still retains a totally stock appearance. This photo was taken the boat haul in Ingalls Head on the island of Grand Manan, New Brunswick, Canada.